Share a gift presentation that’s magical! 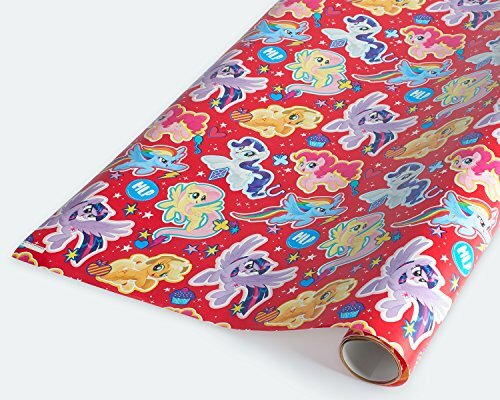 this My little Pony roll wrap design features Pony characters fluttershy, rarity, pinkie pie, applejack, Twilight sparkle and Rainbow dash leaping across a bold Red background. One roll of gift wrap includes a total of 22.5 square feet of wrapping paper-enough to wrap a variety of boxed gifts and more. Use the wrapping paper on its own for a clean look or dress it up with a gift tag, tissue paper flowers, ribbons and bows (all sold separately). it’s perfect for wrapping special gifts for birthdays and any sweet celebration! 1 roll of wrapping paper, 22.5 total sq. Ft. Roll measures 2.5 ft. X 9 ft.
View More In Card Stock. If you have any questions about this product by American Greetings, contact us by completing and submitting the form below. If you are looking for a specif part number, please include it with your message. 8 1/2" x 14" Legal Size Cardstock Sheets for Laser Printers - 50 Sheets - 80lb Cover - White - Perfect for Flyers, Menu's, Posters, Etc.